How well do you listen? I mean REALLY listen? As anyone knows, whether they be coach, client or the most casual watcher of soap operas, we work things out when we talk about them.When I’m in the coaching room, it’s not me working things out, so it’s not me doing the talking. If I’m talking, I can’t be listening, and listening is what I am there for. So outside the coaching room I talk to my friends, and I talk to you, dear reader, through this blog. 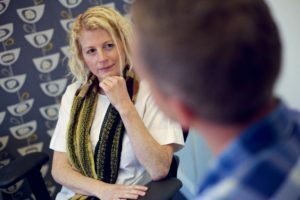 Inside the coaching room, the number one skill for me is listening; by listening I can be truly present for my client and can pick up important things they are saying either with their words or with their body language. My job as coach is then to reflect what I see and hear; ask questions to develop my clients’ thinking, whilst supporting and trusting them to be the best they can be. My job is not to be wise, come up with clever metaphor or showcase my experience (which is handy as I don’t have the answers anyway,) and who cares what my opinion is anyway? If anyone has the answers in my coaching room, it’s my client. This month I’m thinking about listening more than ever as I look after my two month old baby and I try to differentiate the ‘I’m tired’ cry from the ‘my tummy hurts’ cry, and I remind myself, and whoever reads this, what true listening can result in. For my daughter, truly listening to her helps me get her to sleep before she gets over-tired and over-wrought, I learn to tell when she’s hungry and which are favourite toys. These things help our days be happy and, relatively speaking, calm. For me, having someone listen to me in a non judgemental way helps me focus my thinking. It gives me space to explore why I’m feeling what I’m feeling, and that lack of judgement helps quieten my own inner critic. Given that space, I can naturally move my thinking forward myself. In our fast-paced world we so rarely get the chance to slow down and reflect, and someone giving their time to me to encourage me to make that space, means I can move mountains in minutes. How can you give the gift of listening to someone close to you? Next time you’re with a colleague or a friend, try focusing on what they are saying. That sounds obvious doesn’t it? But sometimes, when we think we are listening to another, we’re really listening to our own inner commentary on what we are hearing. Put your opinions of what your friend or colleague is saying, or what you think they are saying, aside, until they’ve had a real chance to speak. What are they saying with their words? What are they saying without words? What emotions can you hear? Are they excited? Frustrated? Nervous? Body language and tone of voice can often tell us more about what is going on than words. Is your friend’s body language contradicting their words? They are saying they are ok but showing subtle signs of unease? How can you respond to that? I think it’s fine to point those things out – as often we don’t notice them in ourselves. Then, to further their thinking you could ask them a nice open question – one that starts with “what…. ?” is a good bet! Then be quiet. Give them thinking time. Don’t ask them four more questions in a row, it will just confuse. And accept whatever answer they give even if it’s not what you expected, in fact especially if it’s not what you expected! By accepting their answer you are accepting them and that’s a wonderful gift to give. And what happens when there isn’t much listening going on? Have you ever been in a meeting where everyone is very keen to state their opinion but not so keen to hear the opinions of others? Ever get the feeling your colleague is not really listening but busy waiting for a moment to chip in with their own agenda? And do you find those meetings result in you both being able to move your work forward? No, I don’t find those meetings work very well either! Listening is a marvellous gift. It not only helps a fellow human feel heard, which boosts confidence and helps a person discover what’s right for them, if it’s a colleague you’re listening to, if can genuinely help you both achieve great things for your organisation. What’s not to love? For all your coaching needs, please get in touch via my website. You may be interested in leadership coaching or team coaching, both areas where developing your listening skills leads to more effective working.